Escrow Closing, Title Insurance, Document Recording and more in Custer, Fall River, Oglala Lakota Counties and surrounding areas! At Southern Hills Title, you have found a full-service title agency that offers land title examination, insurance and escrow closing services for the Black Hills Area of South Dakota. We support real estate buyers and sellers, real estate agents, auctioneers, attorneys, lenders, and mortgage brokers in the Black Hills, offering the best title services in the business. Our focus is to provide an easy and positive customer experience. While we embrace a paperless, digital environment through our state-of-the-art, custom designed software, we also offer versatility and flexibility to our valuable clients. Southern Hills Title offers solutions that simplify your title, insurance and escrow closing activities by producing results when you need them. The Custer and Hot Springs offices provide electronic delivery of our products and services. Our goal is to efficiently respond to your requests, modify your orders on short notice and accommodate your needs in the timeframe you desire. We designed our software specifically for the title business, in order to provide you with full digitized options for every transaction. Our industry-reputable insurance underwriting partners include Stewart Title Company, Old Republic Title Company and Dakota Homestead Insurance Company for the best competitive rates. 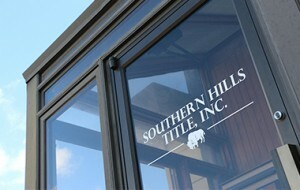 At Southern Hills Title, efficiency, innovation and experience are on your side. Our team of professionals is standing by to provide solutions to your title insurance and closing needs.